I know, I know...another FO. Now don't go thinking I'm the Speed Racer of knitting. All these FOs are happening all at once as a result of my pure laziness of weaving in ends and lack of blocking room. This particular project I was extremely lazy with, all those ends that have to be woven in...now I know why I don't do much intarsia! But I have to admit that the finished product is absolutely lovely and I've gotten tons of compliments on it whenever I wear it. And trust me, I've been wearing it non-stop lately. Ever since the weather has turn utterly crispy cold and being in the shade for even two seconds make your nips fall off. Ohh...over-share. I had finished the knitting on this on the last day of August, but had completely forgotten to take a photo of it before the Mystery KAL contest was over. So I didn't get the chance to enter this bad boy. So sad. Oh well. I enjoyed knitting this, even if the rows did get insanely and annoyingly never-ending long towards the end. I know there were several people doing the KAL that were disappointed by this pattern, but if truth be told I don't know what they were expecting in the first place. If you've ever knit or seen a Stephen West pattern you would know what his style is all about and shouldn't have expected some shawl knit with a lacy border. I should also point out that the majority of people who disliked the pattern were also knitting with highly variegated yarns, something Mr. West cautioned about. I truly love my shawl and I think a lot of that has to do with the colours I chose. Even though I griped about the intaria and having to weave in the millions of ends, this project definitely made my finishing skills better. You can't tell where I've woven in a single end. Added bonus: I now know how to do intarsia properly. No unsightly holes! Yay! I had knit the large size and I'm just glad that I didn't do an extra section three repeat. I had a ton of yarn left over in all three colours and was seriously considering knitting another section just to use up more yarn. Then Andi, one of the lovely ladies in my knitting group who also did the KAL, brought in her finished and blocked shawl to a knit night. She too had knitted the large size and I saw just how big her shawl turned out and decided against the extra section. The completed size that she had was the perfect size that I was looking for. I was happy to learn that I wasn't the only one that had a lot of yarn left over, as it seems that anyone who didn't use scraps had a ton left over too. I think I have maybe a half a skein of each colour left? At first I was thinking of turning the left overs into Hexipuffs, but then a week ago I saw these gorgeous hand warmers on The Purl Bee blog. How awesome that those warmers use Tosh Merino Light too? And from the sounds of it, I have more than enough to knit up a pair AND still be able to make a few Hexipuffs too! Sweet! I'm adding that pattern to the queue...just hope I can get to it before the winter season is over. I also really liked the yarn I was working with. It was my first time knitting with Madelinetosh Tosh Merino Light. 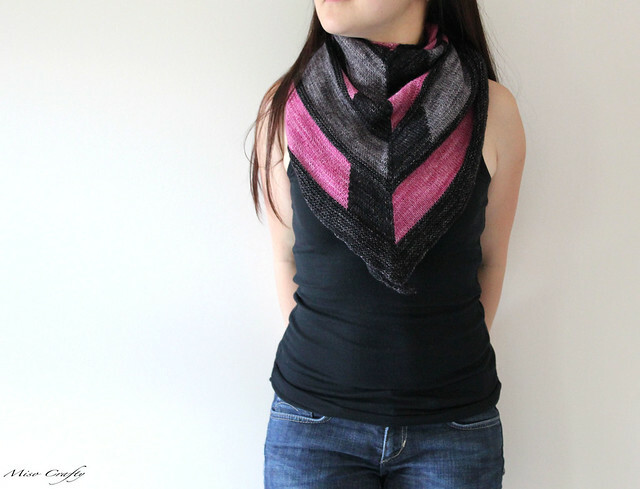 While there was a difference in weight between the black and the pink, I truly loved how the yarn felt as it slide through my fingers. And boy, does this yarn ever block so nicely! I was aggressive (no surprise there) with the border cause my garter hem was starting to flip up, and I tried to stretch the crap out the whole thing in hopes of making the shawl bigger. Which was completely unnecessary as the shawl grew without my help anyways. The yarn gives beautiful stitch definition and the blocking only made it look even better by blooming the yarn just enough to fill in the spaces. Stephen West gave a few options and ideas about what you can do with the border. I chose to go with the simple option of using just the anchor colour, rather than try to incorporate all three. 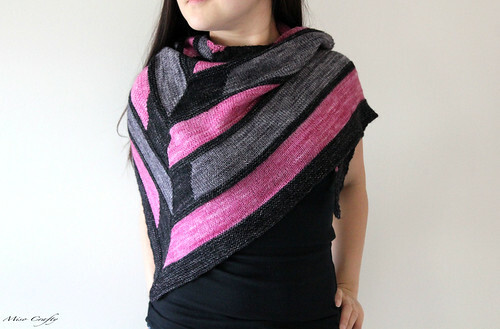 I think the colours are pretty bold together and the fact that the anchor colour is so dark and was used as the point of interest in the middle was enough to turn the shawl into a statement all on its own. I didn't think it needed extra pizzazz. I'll put it out there that I liked this pattern. Yes, it was boring at times but it's great TV or movie knitting...that is, once you get the hang of intarsia and have your numbers right (quite a few people have messed up on the center design and after wondering how they could screw that up I realized it's because they had their stitch counts wrong). I'm a fan of pretty much every design that Stephen West has published and this one is no different. Suffice it to say that I will be knitting a lot more Westknits patterns in the future...I'm already itching to knit up a Daybreak and a Spectra but am holding off until I can get other knitting commitments out of the way. Sadly, I probably won't get to these patterns until the new year (boo erns I tell you, boo erns!). 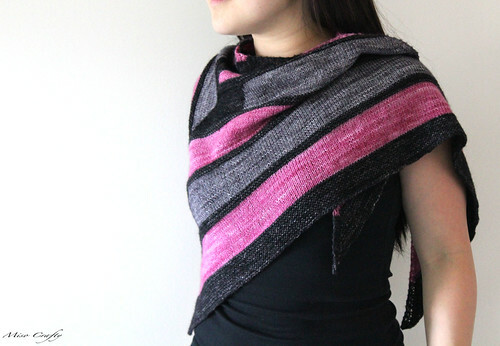 In the meantime, I'm going to wear the heck out of this Westknits design! Bonus: photo of you laughing = the best EVER! That is gorgeous!!!! Love the colors!!! So excited you joined in for the KAL! Can't wait to see your projects. You going to make it out to knit night this weekend? You know we would love to see you anytime. We are all excited to meet ya hun! Thanks Mae! The laughing photo is Brett's favourite too!